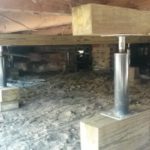 Handyman Services Augusta Ga|Carpentry Work | Handyman Augusta Ga.
All handyman services are guaranteed customer satisfaction. We perform many services so pick up the phone and call us and we'll be happy to talk with you about your project. Sheetrock repair(1994) performed poorly by another contractor. We cut the bad sheet rock out and started over. Finished job with happy customer and another reference. Sheetrock damage(2018) due to poor workmanship and settling of the house. We repaired the settling issue first by installing pier jacks under the damaged area at the entrance door of the house. Our sheetrock repair is different from most companies or sheet rock repair guys. with breathing problems or for clients that would just prefer a more environment safe job this is the only way to go. we all know, very much practiced today. The manufacturers even present it as the primary method of repair. I will admit that I ran into a company in Alabama back in the early 2000's that had been in business for 40 years and they prepped their mud this way until I showed them how to install mud without dry sanding. **Please understand that I am referring to dry sanding and manufacturing an extreme amount of sheetrock dust. ** Cutting sheetrock and installing has a small amount of dust that gets in the air. All job areas should be protected by plastic regardless of which method is used. Basement area(1996) converted into mother-inlaw-suite. This back wall had a 4ft. poured concrete wall with stud framing on top. We cut the openings for door and window through the 8"thick concrete. This took a special concrete saw to cut through the concrete. Not a DIY project for a homeowner to perform on there own. When this job was constructed in the 90's we didn't have all the products available at low prices to wrap the walls. We installed 30# felt over the walls before installing the siding. Windows were caulked at plywood and final around J-channel for the windows and doors. Another happy customer and client for life. Custom Fence built(2018) from Pressure Treated wood. Fence is built from 2x6" P.T., 6"x 6" P.T. post, 1"x 6" dog ear planks. Planks are installed in channels cut into 2"x 6". This fence should have been built from Western Cedar but due to pricing the customer elected to build from a wood that would be much more costly in maintenance. Beautiful fence but high maintenance. Photos on end show how close to house and property line we built without crossing property lines. 1/4 inch gap between fences. Fence is 6 ft. tall and 287 ft. in length for 4 sides with 2 doors. Building a pergola (5/2018) in a landscaped yard with only the room you see. We had to be very careful not to touch the plants or get sawdust on any leaves. This was(2017) an old home built 1920s, the floors were sagging in every room. Different size floor joist in each separate room. Most of the new joist were 2x6 p.t on 16"o.c-20"o.c. 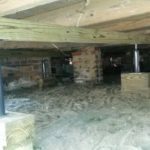 The bid on this job $6200 and the customer had to set the floor joist for proper height and the company would come in and install concrete piers. We came in at $3900 and worked with what they had. We installed 4"x 4"x 12'P.T. across the floor joist 4' ft O.C. We're using 4x6 p.t. blocks instead concrete blocks or solid concrete blocks because the concrete will crack or break under extreme pressure. Example**take a 4" solid concrete block and a BIG sledge hammer and hit the block till it breaks. Now I want you to do the same to a 4x6" p.t. block the same size and the results will always be the same. You can crack or break the concrete block, but you can't break or crack the p.t. block. Yes you can sprinter it and chop it up with an axe or similar tool. The point here is that this small object will have thousands of pounds of pressure pushing against it. The p.t. block is a lot more dense than the concrete block. You also don't want to have to reset the 4x4's because a block cracked and they will. **** For those of you that think you would put 6x6" post under there. Most houses have limited room and your setting these post by hand. Back in the late 90's when Atlanta had a lot of tornado's come through, I was being hired by the insurance companies to reset entire foundations that had been moved by the high winds. When under taking a project like this make sure your hiring an expert, not somebody telling you they can do this work and has no equipment. 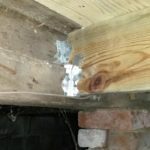 This house (2018)has rotten floor joist and floor above. Belongs to a real estate investor trying to sell the home. So a tight repair is all that will work. To fix the job right you would need to remove all the hardwood flooring above and replace it. (not going to happen here $$$$$$)The photos above are the before and below you will see the repair performed.